The secret to finding out anything you want to know is amazingly simple: Ask good questions. Most people trip through life asking bad questions--of teachers, friends, coworkers, clients, prospects, experts, and suspects. Even people trained in questioning, such as journalists and lawyers, commonly ask questions that get partial or misleading answers. Within professional interrogation circles, author James Pyle is known as a strategic debriefer--meaning there is no one around him more skilled at asking questions and getting answers. He has been training other interrogators in questioning techniques since 1989. James O. Pyle is a human intelligence training instructor who has served the U.S. Army with his expertise at places such as the Defense Language Institute, the United States Army Intelligence Center and School, and the Joint Intelligence of the Pentagon. He resides in Springfield, Virginia. Maryann Karinch is the author of 10 books, most of which address human behavior. Her corporate background includes senior communications positions with technology companies. Maryann and Gregory are coauthors of How to Spot a Liar and I Can Read You Like a Book. Gregory Hartley's expertise as an interrogator first earned him honors with the United States Army. More recently, it has drawn organizations such as the Navy SEALS and national TV to seek his insights about "how to" as well as "why." Greg has an illustrious military record, including earning the prestigious Knowlton Award, which recognizes individuals who have contributed significantly to the promotion of Army Intelligence. Greg has provided expert interrogation analysis for all major networks and many cable television channels, as well as NPR. He has been featured on many drive-time radios shows, morning television, and prime print media such as The Washington Post, US Weekly, and Newsday. "Wish you knew whether the wisecracking guy in the next cubicle got a raise this year? Or whether that stylish woman sipping wine on your first date wants to have kids? Bet you'd like to know whether your nanny really takes the baby outside everyday per your instructions. 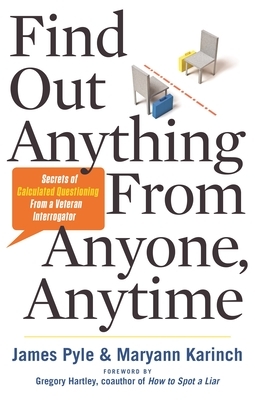 Well, a new book by an army intelligence interrogator could help you get the answers to your most pressing questions." "With his style of questioning alone, Jim Pyle can get more information than most other interrogators using multiple techniques."